Mezo recently took the step into a beautiful new premises in Pretoria. The inspired cabinet company is leading the way with the installation of their third CNC nesting machine, this time proudly, the C-Nest Prestige. 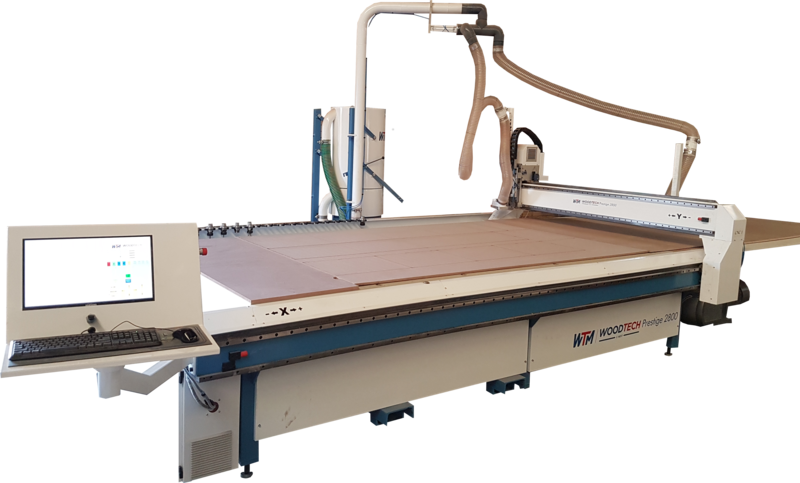 The Prestige is the latest release from WoodTech's C-Nest range of CNC nesting routers. Apart from the usual high speed cutting capability and efficiency of operation, some of the deciding factors for Mezo were the unrivaled cleanliness of WoodTech's extraction system, the ease of control, and build quality. Mezo learned the importance of high efficiency dust extraction from their previously installed machines, where no matter the size of extraction system provided, they could not solve the mountains of dust that was accumulating. WoodTech's high velocity extraction and drum collection system extracts swarf efficiently while keeping expulsion to a minimum. Furthermore, the suction on the sweeper leaves almost no trace of dust behind, greatly reducing the turnaround time to cutting the next board. These extraction systems keep the shop clean and eliminate the need for expensive add-on equipment to solve the dust problem. One example add-on solution are turbo chucks which, in reality, put your spindle at great risk of damage. Swarf tends to get stuck in the vanes of these chucks and cause an imbalance which prematurely damages spindle bearings. This would result in an expensive incurred repair. WoodTech has always pursued simple solutions that effectively solve the process challenges, and again we are proving that this philosophy beats over complication. We are proud to be a supplier to this cutting edge company. Click here for a link to the Mezo website for a view of their beautiful facility and services. The Prestige features in a company video created by Mezo Kitchens, in which the company is introduced, and informative load tests are done on different joining methods. Watch the video below.